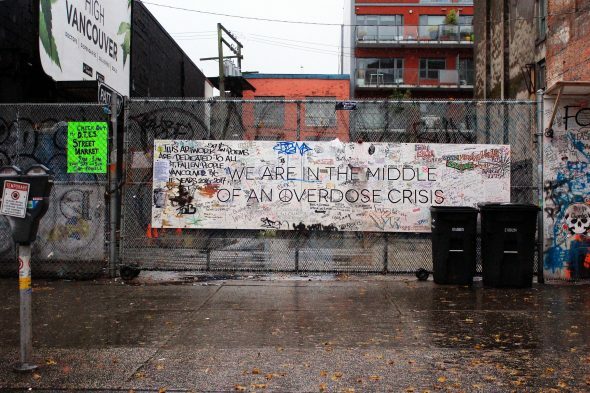 Society is quick to write off the drug users on Vancouver’s streets as expendable, or as junkies unworthy of our attention and the government’s cash. Even though media covers the province’s fentanyl crisis, the reports are so frequent that they often go unnoticed, and they don’t typically mention the people who supply the fentanyl. British Columbia has announced that it is considering stricter punishments for dealers who knowingly sell fentanyl-laced narcotics. By doing so, it follows in the steps of Alberta and Ontario, two provinces which, since October of last year, have been charging alleged fentanyl dealers with manslaughter, according to Global BC. “We strongly believe that, if you’re dealing fentanyl, you’re dealing death,” said Solicitor General Mike Farnworth in the Global BC article. Fentanyl is a synthetic opioid and painkiller which is often cut with other drugs (commonly cocaine, heroin, and methamphetamine), acting as a “buffer” between the various chemical components. It produces a more potent high for those taking what otherwise might be perceived as poor quality narcotics. By adding it to the product, its volume grows, increasing the amount of money that drug dealers can make by selling one supply. Let me put it this way—according to the CBC, a dose of fentanyl the size of a grain of sand can kill you. Vancouver has not faced a public health crisis on this scale since the HIV/AIDS epidemic. The province must put its foot down and address the crisis from more than a public health and harm reduction vantagepoint, it must see the act of supplying fentanyl to users as an attempt to end a life. When a criminal shoots and murders a person in the Downtown Eastside, an investigation into the homicide is launched. But when an addict buys fentanyl-laced narcotics in a back alley and dies, most of the time the people responsible for lacing the drugs go unpunished. For those drug users, it is a sad and lonely death—and I think their deaths warrant justice. In both scenarios, a person was killed by the actions of another. Therefore, the sentence for knowingly dealing fentanyl should be one of manslaughter or murder. Who are we to decide whose life has more merit—that of a wealthy young adult who overdosed during a party, or of an addict who died alone on the street in the middle of the pouring rain? We must treat each death as the tragedy that it is. Opponents to this notion say that increasing the prison sentence for fentanyl dealers will not make a difference in slowing the epidemic, but how can they know for sure? Maybe the threat of facing manslaughter or murder charges will be enough for dealers to reconsider the consequences of their actions. Until we put stiffer sentences in place for people who knowingly deal fentanyl-laced drugs, no one can be certain of whether doing so is a deterrent for that behaviour. It at least deserves to be tested out. Fentanyl dealers show depraved indifference when it comes to ending the life of another human being. The criminal justice system should offer them the same amount of mercy.